With 2018 half over, now is an appropriate time to look at trends in local real estate. The biggest news is that it’s a good time to be a seller. The median price of Lowell deeds recorded in the first half of 2018 was up 12% from the same time last year. From January thru June of 2017, the median price was $237,900, while the median price during the past six months was $265,625. (Remember, this is all deeds – including condominiums – not just those for single family homes). One of the factors causing prices to ascend so rapidly is a lack of homes being put on the market. Even though demand is clearly rising, the number of deeds recorded in the first half of 2018 (2293) showed only a 2% increase from the number recorded in 2017 (2247). Why are there so few houses going on the market? I believe one factor is that many homeowner who purchased or refinanced during the boom years earlier this century are still underwater on their mortgages, meaning they owe more than the property is worth. The basis for this theory comes from scrutinizing recent foreclosures. The majority of the mortgages being foreclosed now originated during those same boom years. And the number of foreclosures keeps going up. 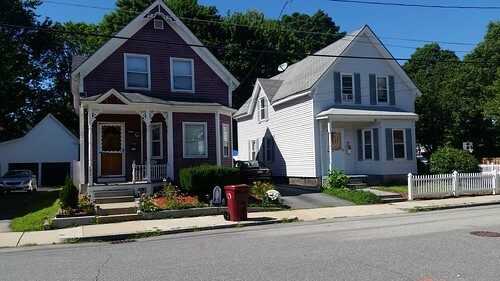 In Lowell, for instance, there were 56 foreclosure deeds recorded in the first six months of 2018 compared to just 48 a year earlier which is an increase of 17%. Similarly, the number of orders of notice, which signal the start of a new foreclosure, was up 12%, rising from 59 in 2017 to 66 in 2018. In the nine other communities in the Middlesex North District, foreclosures were up even more with foreclosure deeds going from 55 to 77 (a 40% rise) and orders of notice from 95 to 107 (a 13% increase). While any rise in foreclosure volume is worrisome, seeing such an increase at a time of steeply rising home prices is even more problematic. That’s because when prices are going up, someone who is unable to pay their mortgage should be able to sell the house and obtain enough from the proceeds of the sale to pay off the mortgage. Certainly the person would be left without a home, but if they remained behind in their mortgage, they would lose the home for foreclosure anyway, an event much harder to recover from than a standard real estate sale. Under this theory, those mortgages from 2003 through 2007 that are now being foreclosed are just the tip of the under-water-iceberg. For every foreclosure, there are presumably many other homeowners who have stayed current in their mortgage payments but still have not had their current home values surpass the amount owed on the mortgage. This freezes them out of the home sale market. One positive note on foreclosures is that the foreclosing lenders seem much more efficient in executing and processing them. Back in 2008 to 2010 when foreclosures spiked, it sometimes took up to 18 months from the time the lender held the foreclosure auction until the property was finally in the hands of a third party buyer who would fix up and cause the property to be occupied. These delays were big contributors in the plague of empty houses that affected the city back then. In contrast, today’s foreclosures are processed much more expeditiously with foreclosing lenders often selling directly to third parties at the foreclosure auction itself, something that never happened ten years ago. But while this rapid transition to new homeowners is good, many of the new owners seem to be institutional investors who may rapidly flip the homes or keep them as rental properties. A rise in absentee-landlordism is not necessarily good for the city’s neighborhoods, so that is something that deserves close monitoring. 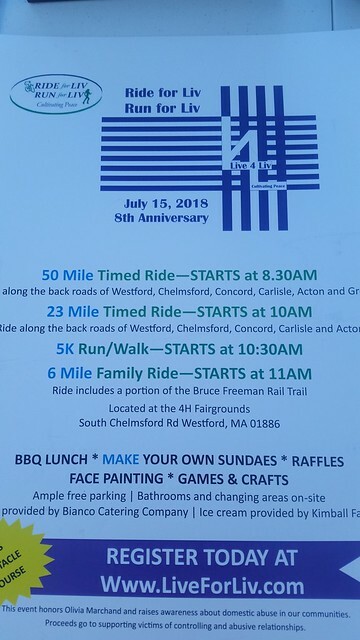 Next Sunday, July 15, 2018, is the eighth annual Ride for Live/Run for Liv at the 4H Fairgrounds on South Chelmsford Road in Westford. The even honors Olivia Marchand, who at age 17, lost her life to an incident of domestic violence. This event celebrates Olivia’s life while raising awareness of domestic violence. In the past, proceeds from the event have gone to Alternative House, The Mahoney Foundation, the Westford Coalition for Nonviolence, and the Westford Police Department. The event includes three routes for bikes (50, 23 and 6 miles) along with a 5K run/walk. The event concludes with a family barbeque. More information is available at the Live for Liv website. Thanks to the 118 people who attended Bob Forrant’s Little Canada walk yesterday afternoon. I wasn’t able to make it but got updates sent to me in real time from some of the walk attendees. 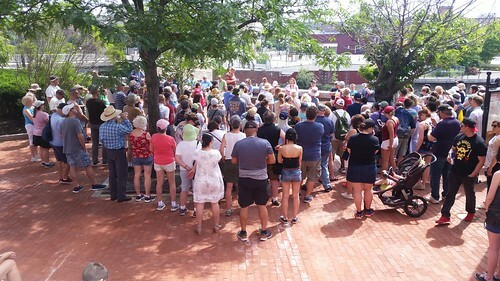 Next Saturday, July 14, 2018, is a “don’t miss” walk: Downtown Lowell Architecture led by Steve Stowell, the longtime administrator of the Lowell Historic Board. The walk begins at 10 am at Lowell National Park Visitor Center at 246 Market Street and will meander through downtown with Steve pointing out some of the amazing architectural details of the buildings that line the streets of downtown Lowell. The following week, Saturday, July 21, 2018, I will join with representatives of Coalition for a Better Acre on a Moody Street: Then and Now walk which will cover the history of that once main thoroughfare, from the founding of the city up until the present day. 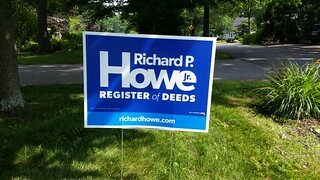 Thanks to everyone who has requested a Richard Howe for Register of Deeds lawn sign. There are plenty of signs left, so if you would like to help my re-election campaign by displaying a sign in your yard, please fill out our online form. While you’re at it (or even if you don’t want a sign) please sign up for my weekly campaign email updates on the same form. Finally, if you haven’t done so yet, please check out and “like” my Richard P Howe for Register of Deeds page on Facebook.